Beware: “Reformers of the Reform” at work in your parish…..
What good furtune to have the clear vision and direct langugage of Eugene Cullen Kennedy. Contemporary English-speaking Catholics around the world are about to be force-fed the new translation despite thousands of appeals that the Vatican “just wait,” and despite widespread objections from theologians, expert translators, and teachers of English prose and poetry. Kennedy’s words should be carved in stone because he sees the liturgical language issue clearly for what it is: Pope Benedict’s big move to undermine more completely Vatican II and return the Catholic Church to Vatican I’s Tridentine rigidity and triumphalism. Like all terrorists, these campaigners (“Reformers of the reform” jwg) believe that Heavenly mansions await them for the earthly damage they do in restoring religion to the slavery of obsessive masters from whom Jesus liberated it. Not for them the church that respects conscience and other religions, that understands and waits for all us limping humans to catch up with it, that celebrates life and embraces and forgives sinners. Vatican II makes faith too easy, in their judgment; they reject a faith that elevates people for spiritual growth and propose a regime that puts them down to keep them in their place. Espousing a “tough” religion doesn’t do much for anybody else but it certainly makes them feel good about themselves. Everything, including the New Translation, squeezes the spirit out of familiar liturgical readings and replaces it with hot air. These efforts flow from the sweeping campaign initiated by Pope John Paul II (Calling him Pope John the Great is part of their program too) to restore the hierarchical church. The hierarchical church’s outdated structure, whose origins were secular rather than sacred, was not a victim of Vatican II but of history itself and the best thing to do is stand clear as it settles into clouds of dust. With his combination of Teutonic rigor and a shopkeeper’s smile, Pope Benedict XVI now charges the bishops, as if they didn’t have enough trouble, with refurbishing the split-level palace that places the pope alone on top, monsignors and assorted officials on the skybox level and lay men and women on the bottom. The failure to understand that Vatican II restored the authentic tradition of collegiality to the church has led to a record level of canonizations on the principle that the more saints the better to buttress the multi-level ecclesiastical dormitory. 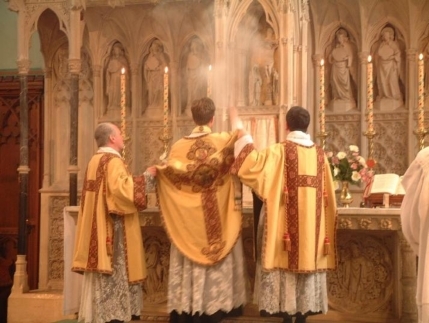 The little murders of these reformers of the reform of Vatican II include the comedy of telling priests who don’t know the language that they can say Mass in Latin and the tragedy of making nice with the Lefebvre heretics who are the Confederate money in the church’s collection plate. The New Translation is a big murder, however, because it represents an assault on the language that bears the Mystery of belief. The translation now in use reveals the purity of theologically based phrases. The New Translation now slays that graceful Mystery by throwing out the baby with the baptismal water. Has Pope Benedict Moved Beyond Cardinal Ratzinger’s Theology?